Lewis Webb jumps on scorer Mark Jones after an early Peterborough Sports goal against Stafford Rangers. Photo: James Richardson. Deeping Rangers will fly the local flag into the second qualifying round of the FA Cup. Michael Goode’s men took advantage of a favourable draw by winning 4-2 at lower-level Brocton of the Midland Football League to equal their best run in the most prestigious knockout competition of them all. Lewis Webb heads home for Peterborough Sports against Stafford Rangers. Photo: James Richardson. Charlie Coulson fired Deeping ahead after 11 minutes and that’s how it stayed until Scott Coupland converted a penalty for 2-0 on the hour. Dan Schiavi made it 3-0 a minute later before the home side pulled two goals back with still 15 minutes to play. Jason Kilbride eased Deeping’s nerves late on, but the United Counties Premier Division side will be the only local team in Monday’s second qualifying round draw (September 4). Peterborough Sports, Holbeach United, Yaxley and Wisbech were all beaten in first qualifying round action today (September 2). A bumper crowd of 284 saw Sports lose a thriller 4-3 to higher-ranked Stafford Rangers at PSL. Josh Moreman (far, blue shirt) has struck a late FA Cup goal for Peterborough Sports v Stafford Rangers. Photo: James Richardson. A 91st minute header from Richard Batchelor saw Stafford through after Sports ‘keeper Aaron Butcher had missed a cross. That was harsh on the city side who struck early through Mark Jones and held that lad until half-time. 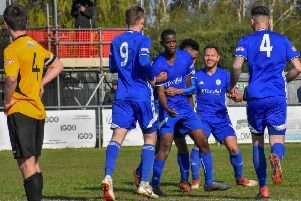 Stafford, who included former Posh player Exodus Geohaghon in their line-up, came out strongly in the second-half to take 2-1 and 3-2 leads, but equalisers from Lewis Webb (77 minutes) and Josh Moreman (84 minutes) looked to have earned Sports a replay. Unbeaten UCL Premier Division side Holbeach lost Dan Dougill to a red card for an alleged elbowing offence midway through the first-half of their game at Grantham when already a goal down. Lewis Leckie equalised for the Tigers from the penalty spot, but a controversially-awarded spot-kick for the home side on the stroke of half-time produced the winning goal. Over 300 fans watched this game, but many would have missed a red card for Holbeach forward Charlie Sanders for dissent after the final whistle. For the second season in a row Yaxley lost 1-0 to Dereham at this stage, while Wisbech were beaten 2-1 at Kempston with Billy Smith scoring late on for the Fenmen. First round qualifying: Brocton 2, Deeping Rangers 4 (Coulson, Coupland, Schiavi, Kildbride); Grantham 2, Holbeach United 1 (Leckie); Peterborough Sports 3 (M. Jones, Webb, Moreman), Stafford Rangers 4; Kempston Rovers 2, Wisbech 1 (Smith); Yaxley 0, Dereham 1.